Tired of your normal chocolate fudge? 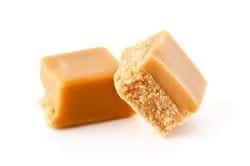 This buttermilk fudge is much like the fudge you see sold in many specialty candy stores without the specialty price. Buttermilk fudge is a delicious fudge you must try. Butter sides of a large heavy saucepan or Dutch oven. Combine first 5 ingredients in a pan and cook over medium-low heat, stirring constantly until butter melts and sugar dissolves. Use a pastry brush dipped in hot water to wash down any sugar crystals on the sides of the pan. Increase heat to medium and bring to a boil. Do not stir while syrup is boiling. Continue to cook until the syrup reaches a softball stage (234 - 240 degrees.) Remove from heat; add vanilla. Do not stir until syrup cools to 200 degrees. Using the medium speed of an electric mixer, beat fudge till thicken and no longer glossy. Stir in walnuts. Pour into buttered 8 x 8-inch pan. Cool completely. Cut into squares and store in an airtight container. Sounds good will def try it soon. Do you also have any recipes – Copycat style- for penuche and pralines?